Beginning the cello finishing process. I use low-angle, relatively dim light to make shadows, hoping that even tiny irregularities in the wood will make enough shadow that I can detect them and gently remove them with a very sharp scraper. In may case, my wife has a better eye for these sort of flaws, so I enlist her help, to find ones that I miss (and invariably, she does). Once the edges, corners and all other surfaces are as close to perfect as I can get them, I brush a weak water-based stain all over it…well…actually, coffee, as strong as I can make it, but it makes only a small change in the color of the wood. the spruce becomes a very light tan, after two coats have been applied and allowed to dry. Between coats, as the water swells the grain of the wood, I sand all over, very lightly, to remover little splinters and rough spots that the water raised up. I happen to like the spruce grain slightly raised, so I am not trying to remove the “corduroy” effect. I just want it to be smooth to the touch, in spite of the ripples. I have been using rosin for a sealer…the last cello, I used rosin mixed with turpentine, which worked nicely, but took a few days to dry. This time I am running out of time, and do not have a few days…so I mixed the rosin with alcohol, and a tiny bit of yellow dye. I sealed the whole instrument except the handle area of the neck, using the rosin, allowed it to dry, and put on a coat of spirit varnish to complete the seal. 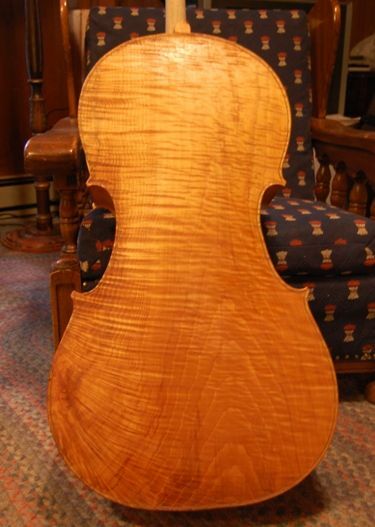 The next step will be a color coat that I hope will define what the cello will look like. If that succeeds, then the remaining coats will be pretty much clear spirit varnish. Here is the front, with the one coat of varnish over the rosin sealer. And the one-piece back, with the grain beginning to show. Varnish does wonders, doesn’t it? 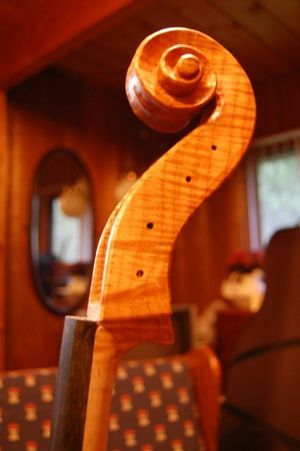 Here’s a front-quarter view with one coat of varnish over the rosin sealer. Back quarter view, same light. Showing the flame of that one-piece back. Interestingly, the sides were actually cut from the same billet as the back, but that portion evidently had a good deal less flame. The neck is a different billet entirely. Nice flame, there. And there’s the scroll. Funny, from this angle, I am seeing things I want to correct. It may be too late. I will have a close look at it tomorrow evening, and make a decision. And after varnishing: final assembly and set-up! Thank you for the well written article. 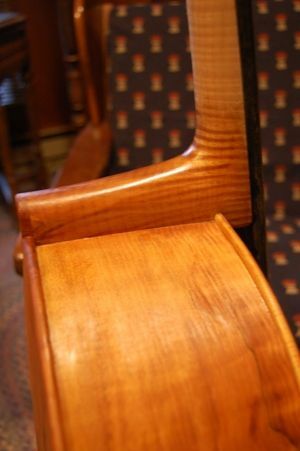 I’m debating my next bass guitar build as a hollow body instead of drowning the wood with lacquer and paint and killing the sustainable of the wood I am very serious about using your finishing techniques and what brand of chemicals would you recommend. Both are stringed instruments and hollow body. I’ll be grateful for any advice and views about my little project. Thank you. Robert, I attempted to reply to your email address. Still waiting for a reply.